I wrote earlier today that May 7th would be a day that lived in infamy. I'm just going to go ahead and pat myself on the back, now. The Nationals pulled out a convincing 5-2 victory over the Marlins (and their second place NL East status) led by The Shark. Leading off and playing CF, Roger Bernadina went 2 for 4 with 2 singles and a walk. He also scored the first run of the game and stole the only base of the game. The rest of the Nats, inspired by the Shark's return, helped out as well, with Daddy Desmond and Jerry Hairston each contributing 2 hits. Jayson Werth and Ian Desmond each had a sacrifice fly during the game. In response, after the game, Marlins players Hanley Ramirez and Chris Coghlan sacrificed Wes Helms in the hopes that it would appease the Shark enough for him to go easy on the Marlins tomorrow. Unfortunately for Helms, it won't work. The Great Werth had an outfield assist, gunning Mike Stanton at first as he rounded the bag a bit too far. "I was in awe of playing in the same field as the Shark. I was looking at him to make sure he saw my single. Did he see it?? Was he impressed?? Did he liiiiiiike ittt??" Stanton said when asked about the miscue. HEY KIDS, WANNA LOOK LIKE ROGER BERNADINA?? 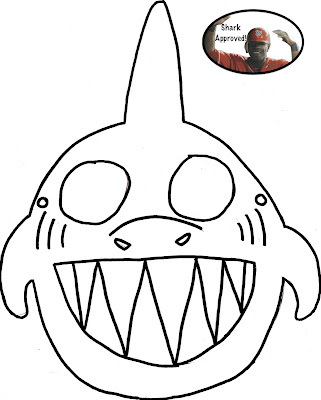 Print out this mask, color it, and then wear it to your next Nationals game! I DESIGNED IT MYSELF!! There is a new Sharkadina Downloads page! All the wallpapers and coloring projects you could desire!